[CIVIL WAR]. 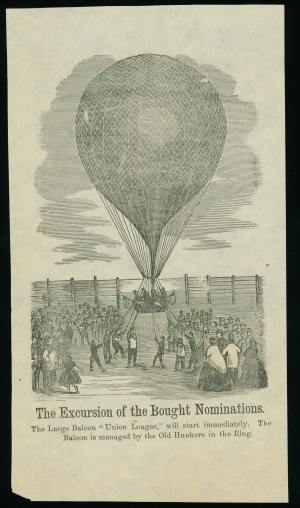 Broadside, “The Excursion of the Bought Nominations, The Large Balloon ‘Union League,’ Will Start Immediately. The Balloon is managed by the Old Hunkers in the Ring.” . 4 ¾ x 8 ½ in. The Union League Club formed in New York in 1863 to support Union troops and cultivate civil devotion. Made up of prominent citizens in New York, Philadelphia, Brooklyn, New Haven, and Chicago, the clubs raised money to provide for the U.S. Sanitary Commission and establish a group of political elites to sustain Union military efforts. The league favored a strong central government, tariff protections, and internal improvements. The “Old Hunkers” were the conservative branch of the New York state Democratic party in the mid-nineteenth century. They favored the status quo, whether in business or on the contentious issue of slavery. The more progressive “Barnburner” faction stood in opposition to the old Hunkers, and were against slavery, strong state powers, expanding the public debt, and government subsidizing businesses. Though the Old Hunkers shared many similarities in terms of business philosophy with the Union League—especially that of strong central government power and infrastructure improvements—the disconnect between the two groups’ stance on slavery makes this cartoon perplexing. Are the Old Hunkers carefully managing the political situation (the balloon) through the New York political machine (note the capital “R” of Ring, as in the infamous Tweed Ring)? Or are they setting the progressive Union Leaguers adrift?